After all the hype and hard work that went into rallying support and votes for the Cosmopolitan Blog Awards, I was completely exhausted and the idea of putting myself forward for another blogging award is really daunting. Not only am I wary of failure, but also conscious that a lot of the effort was put in by my lovely readers, friends and family and I don’t want to be that annoying bug that keeps pestering everybody. But the only way to win an award, in any line of work, is to be nominated and sadly I can’t do that by myself…well without being disqualified anyway and we wouldn’t want that. If you don’t try for something you really want, you won’t get anywhere in life. Being shortlisted for best newcomer was one of the best achievements in my blogging career so far and even though I didn’t win, I came home with some amazing memories, brilliant blogging buddies and a whole lot of excitement for what might be to come for my blog one day. So with the awards glitter and dust finally settled (for this year anyway) and the Cosmopolitan cocktail hangover long behind me, it’s time to kick start a new ‘Vote for Moi’ campaign, starting with the UK Blog Awards 2015. Competition is fierce with a zillion hopeful contenders. Little old me is one of them, so I need all the blog love and support I can muster up to make it through to the next stage…voting couldn’t be simpler. 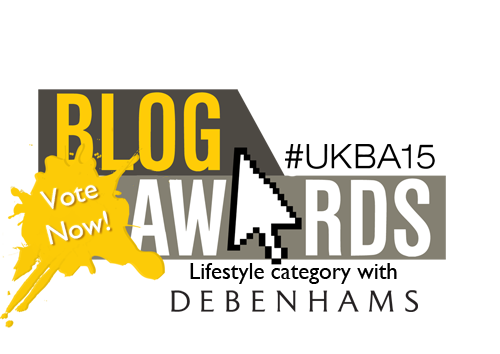 All you need to do is hit the UK Blog Award logo above or click on this link to take you through to Miss Enchanting’s designated voting page and enter your name, email address and submit. It literally takes seconds and you’ll be making one blogger a very happy chick indeed. Voting closes on Monday 1st December 2014…so at least that’s only two weeks of social media bugging, begging and pleading you will all have to endure. Happy days. Thanking you all in advance and please feel free to share the link and the blog love…you are all amazeballs.